Heng Samrin was born in 1934 in Prey Veng Province. Heng Samrin came to international attention when he was appointed from obscurity as president of the National United Front for National Salvation in whose came Cambodia was invaded by Vietnam in December 1978. In January 1979 he became president of the ruling People’s Revolutionary Council of the People’s Republic of Kampuchea and in the following month president of the Council State. 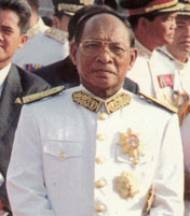 Heng Samrin has served as a political front man without a power base of his own. He became general secretary of the ruling Kampuchean People's Revolutionary Party's central committee in December 1981 after Vietnam's initial nominee had proved unreliable. He remained in that position for nearly a decade until a political settlement came into sight, although real leadership was shared between the prime minister, Hun Sen, and the speaker of the Parliament, Chea Sim. In October 1991 the Kampuchean People's Revolutionary Party changed its name to the Cambodian People's Party, later was replaced Heng Samrin as general secretary for Chea Sim. He was replaced as head of state by prince Norodom Sihanouk when he returned to Cambodia in November 1991.